The artwork for each product is taken from the original illustrations from the Beatrix Potter stories. 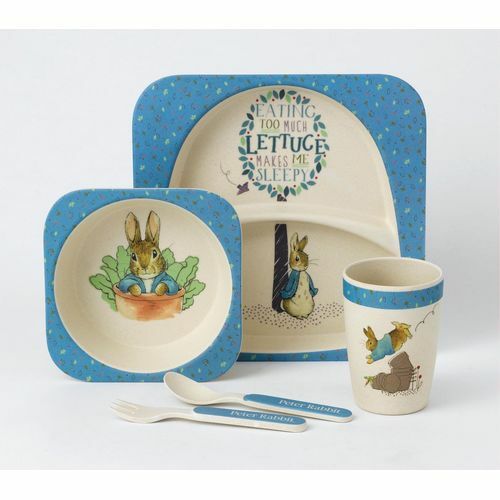 Make mealtimes fun and practical with this Peter Rabbit dinner set. Can be used at home, in the garden, or in the park. This fresh and natural, eco friendly dinner set includes: A plate: 21cm, Bowl: 14cm, Cup: 9cm and cutlery. Organic Bamboo - Eco-friendly childrens dinner sets made from bamboo melamine and packaged in recycled craft card, making thoughtful gifts that will appeal to the eco-minded gift-giver.